I don’t know about you but I am sick of the cold weather now. I’ve been slicking on the berry lipstick and pulling on my ear muffs for far too long and quite frankly, I’m in need of a bit of sunshine, flip flops and pina colada. My usually very oily skin has really dried out this winter and although it is still oily, it is much drier than usual and even more dehydrated than usual. To combat this, I have been trying out some new skincare and have added a new serum into my routine. A serum can slot into your current skincare routine very easily as it is a complimentry product, not something that you would substitute your regular products for. Simply cleanse, tone, apply your eye cream and put your serum on before you apply your moisturiser. 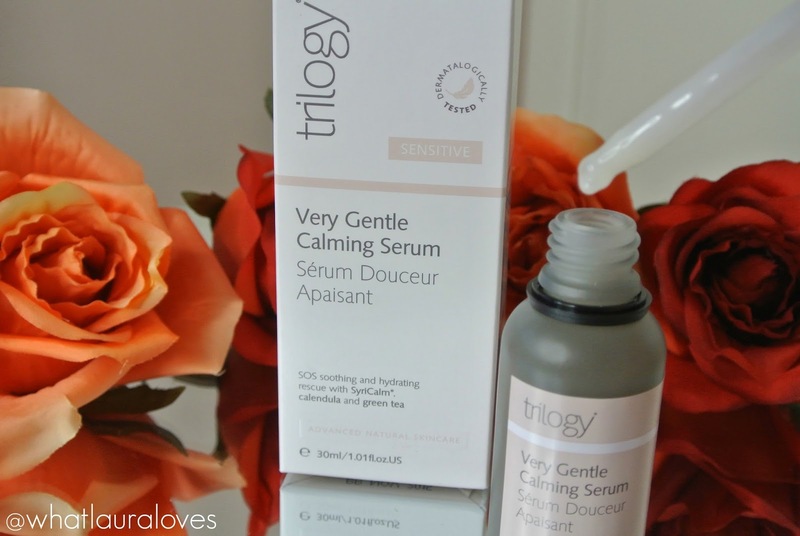 The one that I have been using is the Trilogy Very Gentle Calming Serum which is exactly how it is described- gentle and calming. It combines natural spring water with Chamomile and Calendula extracts for their calming benefits and plant oils for their moisture- repairing benefits. The formula also includes a breakthrough botanical complex known as SyriCalm which is proven to help to reduce skin inflammation, which is associated with ageing, and to strengthen the skins barrier function. This is particularly suited to sensitive skins as they tend to have a weakened skin barrier. If you’re someone who has intolerant skin or skin that is sensitive and easily irritated then this serum would be ideal for you as it feels very calming and comfortable on the skin. I found that it didn’t irritate my skin or make it red and while I don’t have particularly sensitive skin, I don’t think that there is anything in it that would irritate that skin type. It is a very non-offensive and doesn’t have a strong scent or anything like that. The serum is light weight and has a slight milky colour to it. It applies lightly and sinks into the skin quickly without leaving a sticky residue on the skin. I tend to apply this on a morning before my moisturiser, if I am wearing one, as while it does feel hydrating on the skin, it is not moisturising enough, in my opinion, to be worn solely as the only moisturising product on the skin. When I apply it, it feels quite cooling and it really seems to have a soothing effect on the skin which I particularly like if I’ve used it after exfoliating my skin with a chemical exfoliator. As the texture is light weight and quick to dry, this serum is a great layering product and sits really well underneath my current moisturiser. I don’t tend to use it at night as I prefer something a little more heavy duty such as the Trilogy Rosehip Oil Antioxidant+. 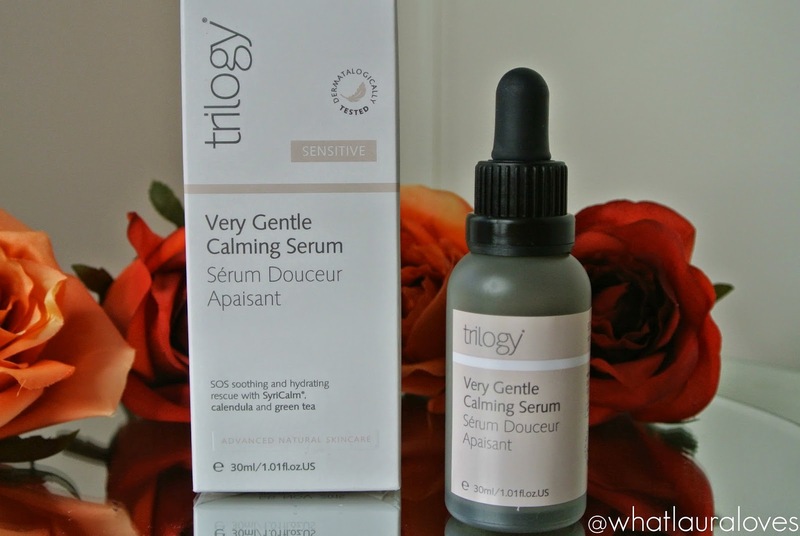 The Very Gentle Calming Serum is available from the Trilogy website, Look Fantastic and Feel Unique (at the time of writing, it is on sale here and if you enter the Feel Unique discount code SALEONSALE10 you’ll get an extra 10% off this weekend only). This sounds lovely! I agree. I am SO tired of Winter. Heck, I've been tired of it since day 1. I despise snow, ice, & cold! Haha. Here's hoping for warmer weather & sunshine soon! Great review! I'm still in search of a great serum, it's so hard to find the right one without spending so much money! This sounds nice. I'm always looking for a good, gentle serum. I'll check it out. Thanks for the review!